How do change the sire for a group of animals? Sometimes the need arises to change a certain piece of information over an entire group of animals. This would most commonly arise from entering the wrong data on a group animal event. To do this you should use the 'Bulk Changes' feature. This allows you to select a group of animals and change a piece of information for the entire group, without having to do each animal individually. 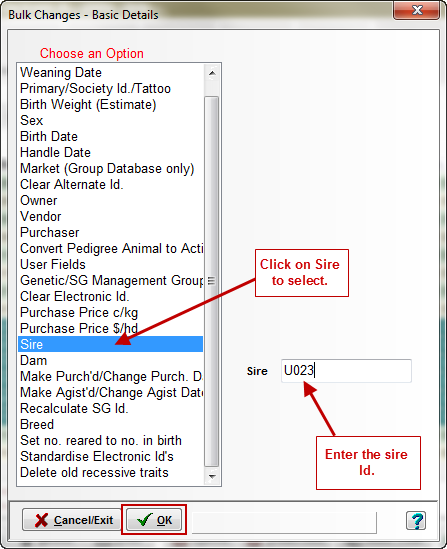 Select the animals that you want to change, either in the current animal listing or in the archive animal listing. A dark green background means that you have selected the animal. You may select animals in a contiguous group by clicking on the first animal in the group, holding down the Shift key and then click on the last animal in the group. All animals between and including those two animals will be selected. By clicking on the Filter button you can also select animals. Animals may be chosen by specifying any combination of criteria (eg. pedigree, mob, group, paddock, property etc.). The more selection criteria, the tighter the selection. Click on Utilities > Bulk Changes > Basic Animal Details menu option. Select the type of data to be changed. ie Sire. This will then prompt you to confirm that you want to proceed with the bulk change.